Remember when wearing silk boxers as pajamas was all the rage? It was somewhere around 1994, and my preteen self had abandoned Hannah Anderson thermals for a pair of satiny Bugs Bunny shorts. 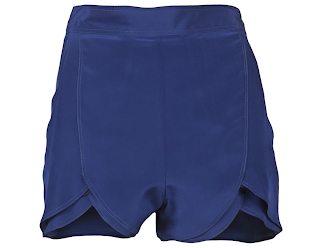 Those Warner Bros. monstrosities were all I could think of when I first encountered the racks and racks of silk shorts this spring. Trying on some cheapo fast-fashion versions (which showed every lump and bump) did little to persuade me that this trend might be worthwhile. And then a pair from Madewell changed everything. I couldn't pass up the graphic print when I spotted these in Madwell on Sunday. I took the shorts to the dressing room fully expecting to hate them once I had them on, but I was oh-so-wrong! They're soft and breezy and somehow totally flattering. Silk shorts done right are the epitome of slouchy comfort - in a way that is far more refined than last year's boyfriend cut-offs. With flat sandals and a t-shirt, you'll never feel over-dressed, but throw on some heels and a blazer and you're ready for a night out. And as much as I love my denim boyfriend shorts, they don't exactly take me from day to night (though for beach to lobster pound, they're pretty perfect). Love them! These are definitely on the top of my list. 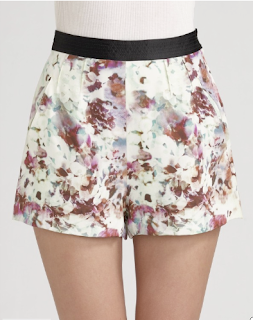 I love the feel of silky shorts-- so casual and luxurious at the same time!